Cologne 2012: Chilean studio Great Things to People (GT2P) present this lamp covered in alpaca hair as part of [D3] Talents at imm cologne this week. 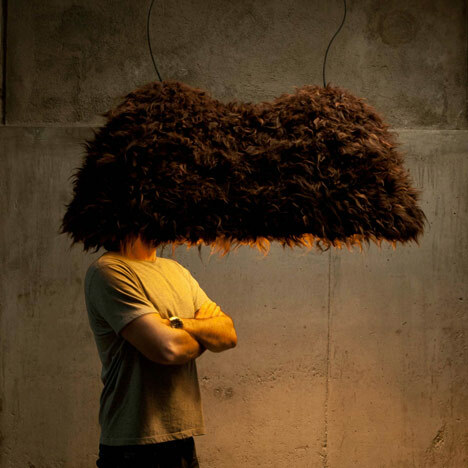 The Gudpaka Lamp is shaped into two hairy humps around two bulbs. It was heat-formed from ABS plastic over an MDF mould, then covered with triangles of plywood on the inside and alpaca hair woven into alpaca felt on the outside. imm cologne continues until 22 January. See all our stories about the event here. The manufacturing process involved the development of a low cost mould of cut and routed mdf by CNC machinery for thermoforming the structure that supports the materials that converge on the lamp. The inner faces of Coigue plywood were cut by laser cutting machine as well as the alpaca felt strips. Then, the outer covering was woven by hand from wasted hair in the process of obtaining Alpaca wool. Its interest in the systematisation of geometric, spatial, natural or artificial phenomena by identifying their variables or relevant parameters (geometry, size, material, etc.) allows creating generative algorithms that can control the form and function. This focus on the systematisation of knowledge allows accumulating the learning of all the projects in a "library" of DNA or rules of design, which are used in each new project. These are reproduced as many times as necessary on the scale which is required, as in architecture, furniture, objects, or interventions in public space, thus creating standard methodologies for non-standard solutions. That is how the concept of digital crafting was born, based on the implementation of digital design methodologies and the experience and the know-how of Chilean artisans, who feed and contribute to qualify each "generative algorithms" or DNA. Through this concept GT2P has succeeded in communicating its ability to investigate, explore and experiment with new materials and processes, and integrate technologies CAD/CAM with traditional techniques and knowledge.